Using MCUV filter can effectively reduce the blue cast, blue cast tone caused by UV. Increase transmittance and make the image more clear. Fine workmanship, good imaging, a good product of your filter. Just click it to buy for your Mavic 2 Zoom 4K Camera! The drone in the following pictures are not included. Crystal clear glass for high definition video. Hydrophobic Nano coating reduces fingerprints fog, water and dust. High Quality Aircraft grade aluminium frame is light and strong, feather light design, durable construction. Easy installation and removal, even after wear and tear. 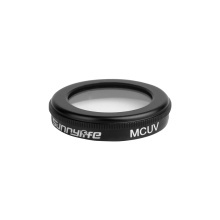 Lens filters accessories, made specifically for the DJI Mavic 2 Zoom 4k camera.